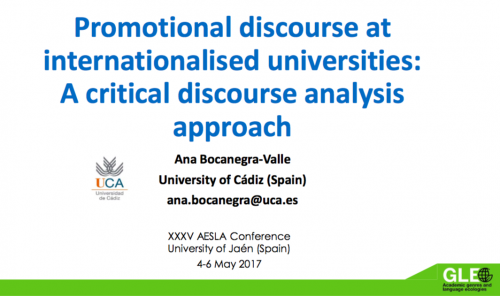 Ana Bocanegra-Valle attended the 35th International Conference of the Spanish Society for Applied Linguistics in Jaén (Spain), 4-6 May 2017. Her presentation, titled “Promotional discourse at internationalised universities: A critical discourse analysis approach”, aimed at furthering the existing debate about the marketization of higher education institutional discourse and set out to explore the discursive strategies employed by internationalised universities to appear trustworthy and generate interest among potential incoming international students. This presentation will be published in due course.